I have been MIA. Work and dogs have been overwhelming. On the happy side, I took Geena Bea to agility tonight and she showed up everyone! Even a dog that is 3 ribbons shy of the highest title you can earn! I hope she does this well when we go to trial the weekend before Thanksgiving!!! I put a card together tonight when I got home. I had colored the image over the weekend and just needed to decide what to do with it. I found a sketch at Atlantic Hearts. The image is Luka from La La Land, stamped with Memento Tuxedo Black and colored with Copics. The sentiment, punched out and backed with glitter paper, is from Pink Cat Studio and is stamped with Memento Rhubarb Stalk. It is popped up with 3M foam tape. 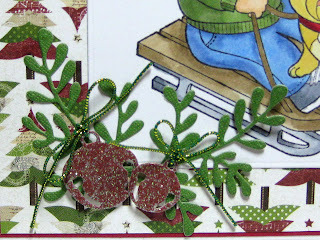 I used DCWV glitter paper for the bells, die cut with dies from CC Designs and bows made from elastic cord. The bells are popped up with foam tape. The sprigs are from Memory Box. The image is cut out with a die from MFT. DP is from Carta Bella So this is Christmas. Yea, another card for my Christmas stash!!! I love the Atlantic Hearts Sketch Challenges! And I love this image. This is such a cute little boy--I must beef up my stash. Your coloring is great! Love all the shadows on the pants. And I love what you did with his rosy little cheeks. Very cute! This card I like :) it makes me thinking about how fun it was to bob-sleigh as a kid. You have made a great card and I just love it, keep up your good work. Thanks for playing along whit us this week at Atlantic Heart Sketch Challenge. Love the sprig and the cute image! Great colouring. 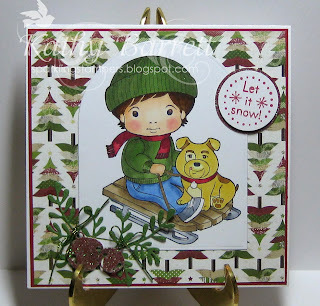 TYFS and joining in on the fun at Christmas Card Challenges #49. Oh love your card. We use to sled ride a lot as a kid. Great DP too. Thanks for joining us at Created with love challenges. Beautiful card. thank you so much for sharing with us at AHSC!! This is darling. Love your image and coloring. Thanks for joining us at Christmas Card Challenges this week. Fab card! 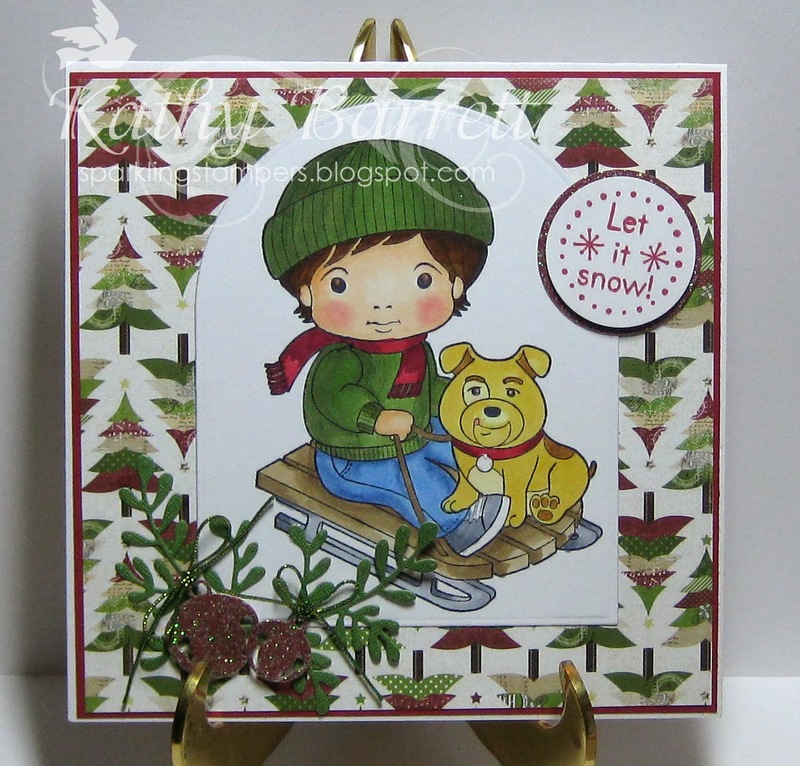 Thanks for joining us this week at Created With Love Challenges for our Christmas Red/Green Challenge! What a darling little boy! I love to color, but have not ventured into the possibilities that alcohol markers have. Great card, the image is super cute! Thanks for sharing! Super cute! Thanks for playing along at Atlantic Hearts.